Stories from the pulp magazine. One of the swiftness radio series, the True Detective Mysteries program broadcast over CBS every Thursday evening, owes much of its popularity to the action which takes place in the studio. Reproducing as it does true stories of various police cases, it is often impossible to go into every detail of the story, and so far no one has actually been murdered in the broadcast: but when a struggle is indicated in the script the actors proceed to struggle; when the gong and siren on the police cars are heard, there are sirens and gongs in the studio. 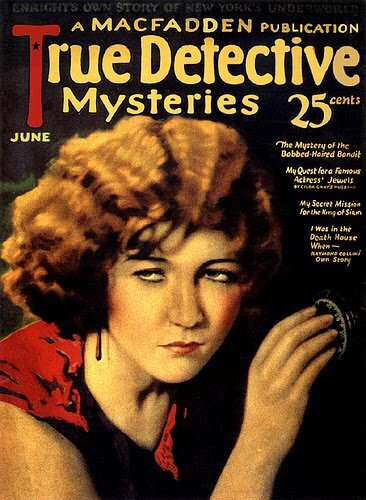 Staged under the direction of Charles Schenck, one of radio's pioneers in stagecraft, "True Detective Mysteries" utilizes approximately the same cast each week to dramatize the more thrilling story in the current issue of the magazine from which it takes its name. Much of the program's success is due to the fact Mr. Schenck has been able to assemble the cast which his experience has shown him possesses really ideal voices for the microphone, as well as dramatic ability. The sound effects, pistol shots, slamming doors, crashing glass, speeding autos---every conceivable noise, in fact---are produced by one man, who sets up his apparatus before his own special microphone, and, working from his own copy of the script, follows his cues as carefully and promptly as do the actors.